Team Oracle calls the tide, which swept AC72 out past the Golden Gate, the strongest of the year. 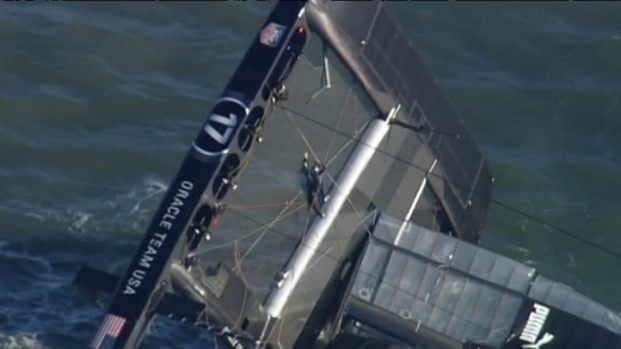 A nearly $8 million, 72-foot catamaran used by the Oracle Team USA, the defending America's Cup champion, capsized during practice near the Golden Gate Bridge Tuesday and was severely damaged. There were no injuries but the $2 million wing of the new ship was was "damaged beyond recognition," team officials said. The AC 72 boat, a massive vessel with a 13,000-pound hull and a 131-foot mast that launched this year, was towed back to the team's base at Pier 80, according to The New York Times. There were 14 people on the boat when it capsized about four miles offshore, all of whom were unhurt. With winds blowing at 25 knots and a strong ebb current in the San Francisco Bay, the team attempted a move known as a bear-away at about 3 p.m. 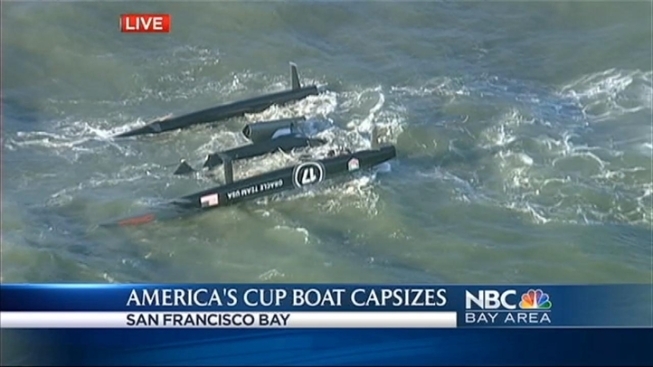 This is raw video of an Oracle Team USA boat with the America's Cup racing event capsized in San Francisco Bay Tuesday afternoon. 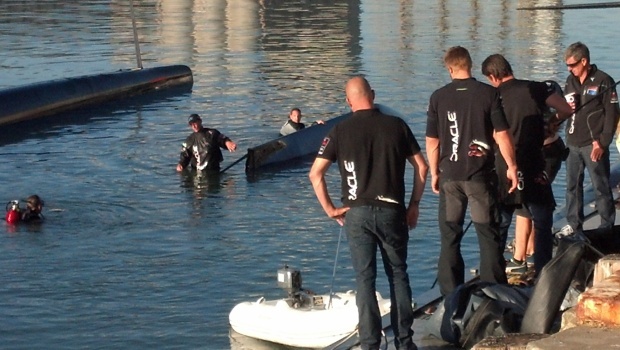 Technician Tom Slingsby said in a statement that as the boat accelerated it pitch-poled. "When the nose went down, the wing hit and a few guys went in the water," he said. "We were unsure if the wing would snap, so we all climbed off the boat." Speaking later at a press conference, Slingsby said the ordeal was "pretty scary, I guess. Surreal feeling." By 4:30, the boat turned upside down, and by 5 p.m. it was breaking apart. Tow boats weren't enough to move the vessel, which was sucked out past the Golden Gate in the early hours of the boat's rescue. The wing of the ship appeared to break away from the boat just before 5 p.m. and was breaking into parts a few minutes later. Four or five crew members remained on the boat, but it wasn't clear what they were trying to do. There were dozens of pieces of the boat floating nearby. The Coast Guard was available to assist, but Oracle Team USA said they performed the rescue operation on their own. Below is a short video clip that shows capsize. Local America's Cup fan Andrew Wisner is the photographer. Team Oracle said what happened Tuesday will not impact their efforts to win next year's America's Cup race which will take place on the San Francisco Bay in Sept. 2013. "A strong team will bounce back from that," said skipper Jimmy Spithill.